Neurosurgery, or the premeditated incision into the head for pain relief, has been around for thousands of years, but notable advancements in neurosurgery have only come within the last hundred years. The Incas appear to have practiced a procedure known as trepanation since the late Stone age. During the Middle Ages in Arabia from 936 to 1013 AD, Al-Zahrawi performed surgical treatments of head injuries, skull fractures, spinal injuries, hydrocephalus, subdural effusions and headache. The main advancements in neurosurgery came about as a result of highly crafted tools. Modern neurosurgical tools, or instruments, include chisels, curettes, dissectors, distractors, elevators, forceps, hooks, impactors, probes, suction tubes, power tools, and robots. Most of these modern tools, like chisels, elevators, forcepts, hooks, impactors, and probes, have been in medical practice for a relatively long time. The main difference of these tools, pre and post advancement in neurosurgery, were the precision in which they were crafted. These tools are crafted with edges that are within a millimeter of desired accuracy. 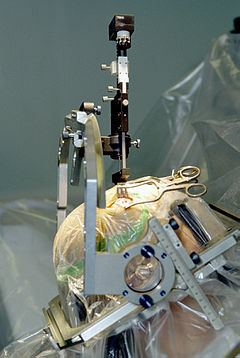 Other tools such as hand held power saws and robots have only recently been commonly used inside of a neurological operating room. As an example, the University of Utah developed a device for computer-aided design / computer-aided manufacturing (CAD-CAM) which uses an image-guided system to define a cutting tool path for a robotic cranial drill. Vascular neurosurgery includes clipping of aneurysms and performing carotid endarterectomy (CEA). While pathology has been studied for millennia only within the last few hundred years has medicine focused on a tissue- and organ-based approach to tissue disease. In 1810, Thomas Hodgkin started to look at the damaged tissue for the cause. This was conjoined with the emergence of microscopy and started the current understanding of how the tissue of the human body is studied. Endovascular surgical neuroradiology utilize endovascular image guided procedures for the treatment of aneurysms, AVMs, carotid stenosis, strokes, and spinal malformations, and vasospasms. Techniques such as angioplasty, stenting, clot retrieval, embolization, and diagnostic angiography are endovascular procedures. ^ a b Preul, Mark C. (2005). "History of brain tumor surgery". Neurosurgical Focus. 18 (4): 1. doi:10.3171/foc.2005.18.4.1. ^ a b Kirkpatrick, Douglas B. (1984). "The first primary brain-tumor operation". Journal of Neurosurgery. 61 (5): 809–13. doi:10.3171/jns.1984.61.5.0809. PMID 6387062. ^ "Neurosurgery". illinoisneurospine.com. Retrieved 2019-04-15. ^ Wickens, Andrew P. (2014-12-08). A History of the Brain: From Stone Age surgery to modern neuroscience. Psychology Press. ISBN 9781317744825. ^ Andrushko, Valerie A.; Verano, John W. (September 2008). 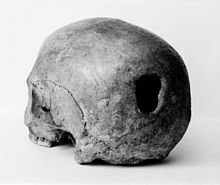 "Prehistoric trepanation in the Cuzco region of Peru: A view into an ancient Andean practice". American Journal of Physical Anthropology. 137 (1): 4–13. doi:10.1002/ajpa.20836. PMID 18386793. ^ Al-Rodhan, N. R.; Fox, J. L. (1986-07-01). "Al-Zahrawi and Arabian neurosurgery, 936-1013 AD". Surgical Neurology. 26 (1): 92–95. doi:10.1016/0090-3019(86)90070-4. ISSN 0090-3019. PMID 3520907. ^ "Alexander Hughes Bennett (1848-1901): Rickman John Godlee (1849-1925)". Ca: A Cancer Journal for Clinicians. 24 (3): 169–170. 1974. doi:10.3322/canjclin.24.3.169. ^ "Robotics in Neurosurgery". Neurosurgical Focus. 42 (5). 1 May 2017. Retrieved 14 November 2018. ^ Esposito, Thomas J.; Reed, R. Lawrence; Gamelli, Richard L.; Luchette, Fred A. (2005-01-01). "Neurosurgical Coverage: Essential, Desired, or Irrelevant for Good Patient Care and Trauma Center Status". Transactions of the ... Meeting of the American Surgical Association. 123: 67–76. doi:10.1097/01.sla.0000179624.50455.db. ISSN 0066-0833. PMC 1357744. PMID 16135922. ^ van den Tweel, Jan G.; Taylor, Clive R. (2010). "A brief history of pathology". Virchows Archiv. 457 (1): 3–10. doi:10.1007/s00428-010-0934-4. PMC 2895866. PMID 20499087. ^ Chivukula, Srinivas; Grandhi, Ramesh; Friedlander, Robert M. (2014). "A brief history of early neuroanesthesia". Neurosurgical Focus. 36 (4): E2. doi:10.3171/2014.2.FOCUS13578. PMID 24684332. ^ Castillo, Mauricio (2005). Neuroradiology Companion: Methods, Guidelines, and Imaging Fundamentals, 3rd ed. Philadelphia: Lippincott Williams & Wilkins. pp. 1–428.